When I started my career in public relations, I made a tiny little salary. To match my income, I lived in a shoebox of an apartment with a kitchen smaller than most bread boxes, and with as much storage space. I was on a strict food budget of $40 a week. And I did pretty well at staying within it. Yet night after night, I would come home to find only a random collection of milk, spinach, diet coke, and a lonely piece of cheese. I was absolutely terrible at planning meals and thinking ahead, you see. So I usually ended up gnawing on the end of an old block of cheese while watching “Law & Order: SVU” and wondering how I failed at adulting so badly. After many consecutive nights of this sad routine, I started researching how to be better at planning and grocery shopping. When I finally put meal planning as a single person into practice, I ended up saving money in the process. Groceries can eat up a big chunk of your budget. And most people don’t even use what they buy. According to the United Nations Environment Programme, people waste 40% of their food, or about 20 lbs per person, per month. When you’re short on income, that’s just throwing money away. Plan your schedule: Think about days you actually have time to cook and what days you stumble in the door miserable and tired. On days you get home exhausted, you might plan something simple, like a salad. When you have more time, you can actually roast a chicken. Check the circulars: Check your grocery store circulars–most are online–to get the latest deals on meats or produce. By seeing what the specials are, you can then look for budget-friendly recipes. Look for recipes: While Pinterest can be great inspiration, pinned recipes can be complicated and intimidating for new cooks. And nothing is worse than being hungry and having a Pinterest-fail moment. Instead, check out, Budget Bytes, Easy Recipes or Cooking in College for simple and quick options. 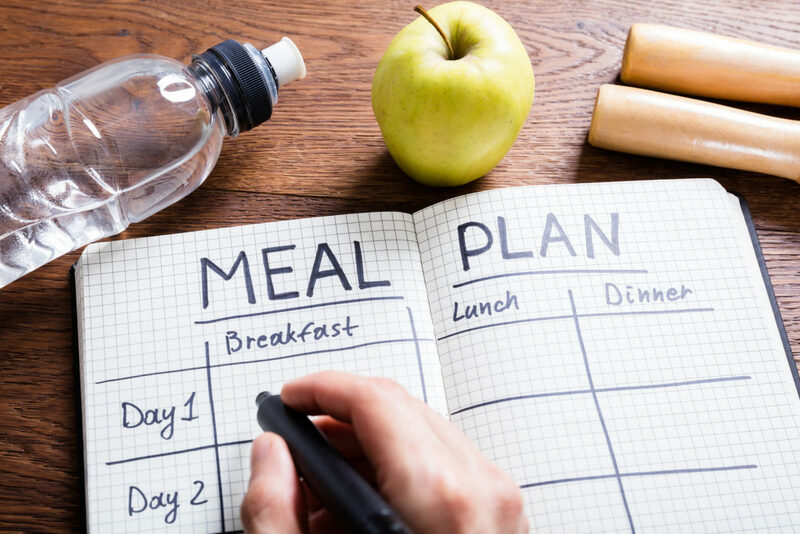 Plan your meals: Plan your meals based around your schedule and the recipes you found. For example, Sunday night you might roast a chicken. Monday when you’re exhausted, you might have salad with chicken. Tuesday, you can make tacos with the leftover meat. Wednesday you may just do soup and a sandwich. On Thursday, with the weekend close by, you might spend more time on dinner and make a stew. And Friday, you can eat leftovers before heading out with friends. Freeze the extras: When you’re cooking for one, you may end up with a lot of leftovers that you cannot eat yourself, and that’s great! I would throw my leftovers in ziploc bags in the freezer. When I would come home too beat to cook, I would thaw one of the meals and still have something nutritious and cheap to eat. Meal planning isn’t particularly hard. Unless, that is, you are like me and have no idea what you’re doing, don’t understand what spices complement one another and cannot figure out how to use leftover ingredients. If that’s you, cheat a little and subscribe to a service like 5 Dinners in an Hour. For just $5 a month, they’ll send you a complete grocery list and recipes that fit your needs. I used 5 Dinners in an Hour and found that they actually saved me money; I ate better and didn’t waste anything. The recipes were stupid-simple to follow–even I couldn’t screw them up–and delicious. If you are sick of scrambling for supper, give meal planning a try. It will help you save money, eat healthier, and reduce food waste. If I can do it, you absolutely can!